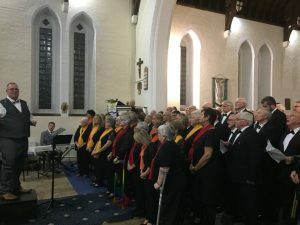 The audience of St. Donat’s Abercynon who attended the 48th Annual Concert of Cor Meibion Abercynon were treated to an amazing evening of choral music. The male choir was outstanding, singing old favourites as well as a lot of new repertoire and everyone enjoyed the performances of guest choir Sharlstone and Featherstone from Yorkshire. Musical Director, Andrew Chinnock was delighted with the performances saying: “It was great to see the church packed to the rafters to see excellent performances from all three choirs. This was our (The Phoenix Singers) first proper concert since I was appointed and I was delighted with how they sang and with the excellent feedback given by so many who see how much we’ve progressed this year!” The Phoenix Singers were delighted to be part of the evening and all choirs combined for a spectacular finale rendition of One Day More, from Les Miserables, arranged especially for the evening by MD Andrew. Thank you for an amazing experience. We really enjoyed ourselves.